As a supplier, you contribute to Vasakronan’s business being run in a sustainable manner, including financially, environmentally and socially. That’s why it’s important for all of our suppliers to be well versed in our values and ways of working. Read more about our business model and our goals. Interested in working with Vasakronan but not doing so yet? Click here. Sustainability issues are a natural and integrated part of Vasakronan’s business. That’s why it’s important to us that you as a supplier work sustainably as well. We require our suppliers’ employees – those who perform work on our behalf – to have good working conditions, a good working environment and one that is free from discrimination-free. In addition, our suppliers are required to comply with laws and regulations, to conduct themselves in accordance with accepted business ethics and to work actively to reduce their environmental impact. To ensure that our requirements are met, all suppliers and their subcontractors are required to accept our Code of Conduct for Suppliers. Read more about our responsibility and how we work sustainably. We are required to reduce the amount of materials we use in our renovation, extension and projects. The bulk of our efforts must focus on reusing and saving existing materials. The second prong of our efforts will rely on using recycled materials. In cases where new materials are used, they must primarily be manufactured from recycled raw materials. Our goal is for the materials we use to have a low environmental impact and not to contain any hazardous substances. Using Byggvarubedömningen (the Building Materials Assessment system) gives us information about what a construction product contains. 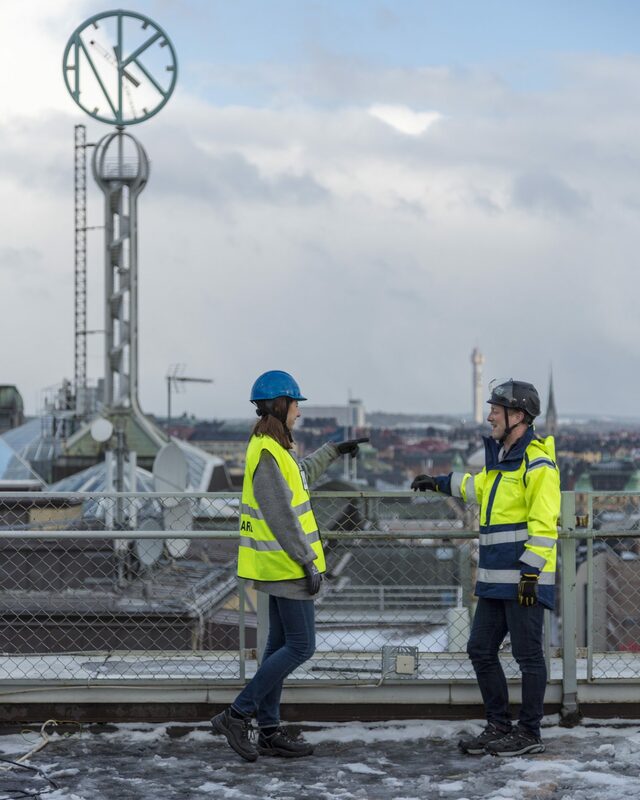 Many of Sweden’s largest property owners and developers have joined forces to develop a standard for performing environmental assessments on building materials. This system is called Byggvarubedömningen. The ambition is for the buildings of tomorrow to be built and managed using only environmentally assessed products. As a Vasakronan supplier, you need to be familiar with Byggvarubedömningen and how the system contributes to Vasakronan’s business. As a supplier, you play an active role in specifying or selecting building materials, and must have a registered membership with Byggvarubedömningen. You must also be familiar with Vasakronan’s procedure for registering projects in the system, and with how to handle materials that do not live up to the requirements imposed by Byggvarubedömningen. Vasakronan wishes to increase the proportion of reused materials in our property renovation projects. The bulk of our efforts must focus on attempting to reuse and save existing materials on-site – in other words, the changes made should be as small as possible. Secondly, we will use recycled materials, either from our own properties or by purchasing materials from third parties. Materials that we do not have the opportunity to use ourselves are to be sold on to third parties. Vasakronan cooperates with several different partners with regard to materials recycling. As a supplier, you must be familiar with Vasakronan’s procedures for the reuse of materials. Communication is a critical factor for us at Vasakronan in terms of building sustainable relationships with our tenants. As a supplier, we expect you to meet our customers in the same way when you perform assignments on our behalf. We have a number of different interfaces and support systems in place to help you succeed in this. It is important to communicate to the tenants at the property about ongoing projects and disruptive work. This can be done by issuing a property news item in Vasakronan’s mobile app, Hyresgästinfo (Tenantinfo), via our digital signs or by posting hallway flyers in the property, by sending mailers out to our key contacts contacts at the tenant, or by putting up roll-ups in building entrances. You are responsible for notifying the Deputy Property Manager or the Administrative Assistant, who will help you manage the communication. If a specific tenant is affected by the project, ongoing reconciliations must be held with the tenant. The Project Client, Property Manager and Property Head of Technology are summoned to attend the final inspection. Depending on the structure of the lease, the tenant may also be invited. The inspection is summarised in a statement giving an account of open deficiencies and defects. Adverse inspection findings are followed up on and remedied. A post-inspection is carried out if necessary. As-built documentation, operating and maintenance instructions and project documentation must be handed over to Vasakronan’s management organisation by up-loading these documents to the management archive via RITA (Vasakronan’s system for storing and maintaining blueprints and management documents). The documents must be reviewed by the operations manager and must be approved by the project manager. Management is responsible for ensuring that relevant information is saved to DeDU (DeDU is Vasakronan’s system support for supervision rounds and error reporting). The customer team takes over the responsibility for operation and servicing in connection with handover. Following this, initiate a handover meeting with the tenant. Coordinate this with the technical unit manager and the project client. The implementation of the project is discussed in connection with the handover meeting. Your agreement with Vasakronan sets out in writing the rules that apply regarding confidentiality of data and documents. If you are a consultant and you are given access to Vasakronan’s IT environment in your role but you do not have a formal employment contract with Vasakronan, you will be required to sign a confidentiality agreement. Vasakronan’s IT Support is responsible for ensuring that the confidentiality agreement is sent out when an account is created. Vasakronan’s internal project managers are then responsible for ensuring that the confidentiality agreement is signed and sent back to IT Support. For general questions concerning confidentiality, please contact Vasakronan’s purchasing department. Should you have questions about confidentiality related to Vasakronan’s IT environment, please contact IT Support or Vasakronan’s internal project managers. We combat all forms of corruption and other irregularities. All of our employees and suppliers are expected to comply with applicable laws and regulations and with the codes of conduct that have been established by Vasakronan; one for employees and one for suppliers. If you suspect that something is not quite right, you can report it. Either to Vasakronan’s internal Compliance Officer or to the company’s external whistleblower function. The external whistleblower function is a body that may be contacted anonymously by both employees and external operators, such as customers and suppliers. Your communication with the compliance officer are covered by what is referred to as the freedom to pass on information. This means that the compliance officer is bound by confidentiality regarding the identity of the whistleblower. You can reach Sheila Florell by email: sheila.florell@vasakronan.se or phone: +46 (0)8-566 205 56. Interaktiv Säkerhet is Vasakronan’s external whistleblower function. The company acts as an agent for Vasakronan, thus guaranteeing the whistleblower’s anonymity. Customers, suppliers and other stakeholders are welcome to contact Interaktiv Säkerhet to file a report. 2. Call Interaktiv Säkerhet on weekdays from 8:00 a.m. to 4:30 p.m. Phone: +46 (0)770-455 580. An incident/accident is something that happens in/around Vasakronan’s properties, including accidents involving customers or visitors. If an incident/accident should occur, you are required to contact the client (Vasakronan’s project manager). The project manager reports the incident/accident according to the procedure that Vasakronan has in place for this. A workplace accident involves a person at the construction site. If a supplier should be affected by a workplace accident during the project, you are required to contact the client (Vasakronan’s project manager). The project manager reports the workplace accident according to the procedure that Vasakronan has in place for this.